Back in the day, when I was a kidlet groing up in the South, my breakfast was usually biscuits with brown flour gravy, grits swimming in melted butter, crisp country bacon, and eggs over easy. No one ever talked about cholesterol, and people thought that breakfast was the best way to start the day. I wish it was, it's still one of my favorite food memories. But, I rarely have that type of breakfast now. Instead, I usually eat cereal. One of my resolutions for this new year was to eat more steel cut oatmeal. I prefer it to the more familiar oats that I grew up eating. It has a better texture, I think, and it fills me up better and holds off hunger longer than other types of cereal. And, of course, it's very healthy for you. It's full of soluble fiber, which reduces LDL, the "bad" cholesterol that leads to plaque buildup. 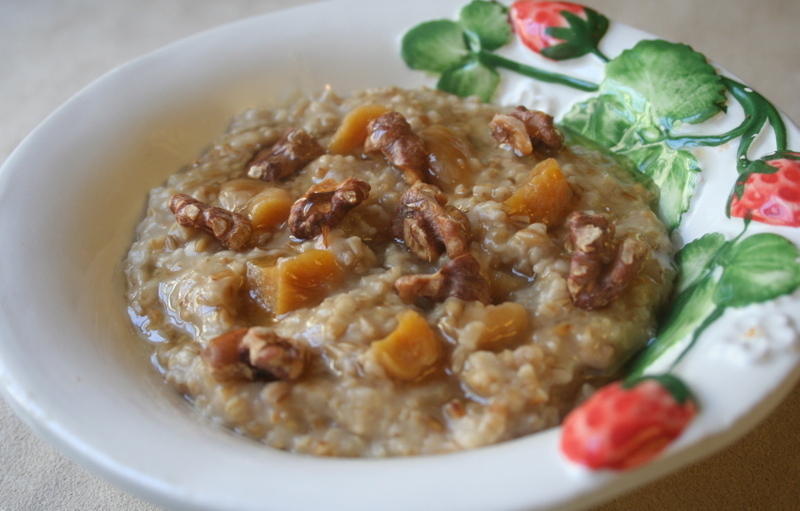 This recipe include walnuts, which also reduces LDL, and like oatmeal can increase HDL, the "good" cholesterol. I found this recipe in Martha Stewart living, which calls for roasting the oatmeal and walnuts. Roasting usually improves the flavor of food, and it gave the oatmeal a nice toasty flavor. This is a lovely way to start the day. But, I wish they would discover startling new evidence that my old fat laden Southern breakfast was actually good for your heart. A girl can dream, can't she?